I'm pale all year round without fail. I go on holiday and my skin's idea of a tan is to go a lobster shade of red and then straight back to milk bottle legs and arms. 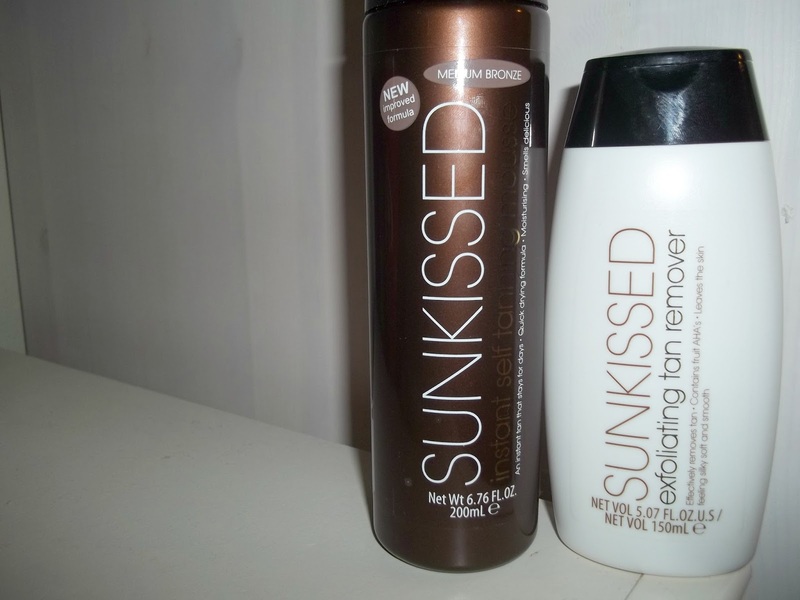 So when Sunkissed sent me these goodies I couldn't wait to try them out and I've got nothing but good things to say! With the upcoming party season fast approaching I definitely needed a self tan that wouldn't be letting me down. I'd actually had a dabble in Sunkissed's cosmetic range when I was a lot younger and enjoyed it back then so it's nice to go back to a familiar brand from your younger days isn't it? Firstly the Application Mitt* (£3.99) works a treat, leaves my skin with no streaks and an even and flawless natural looking tan. My favourite thing about the mitt as I don't get any stains on my hands like you do with a lot of mitts out there. This usually leaves my tan uneven and patchy on my hands/wrists area but no problems with this mitt from Sunkissed. Then onto the Instant Self Tanning Mousse in Medium Bronze* (£4.99), nothing but good from this bottle of magic. Now you might not believe me until you try it but this doesn't have that digestive biscuit smell that self tan usually does have - instead it has a coconut scent to it. This makes me a massive fan as I love fruit scented beauty products. Gold star to Sunkissed for this as I can say goodbye to worrying about stinking a room out with self tan. Now this is an instant tan and as I mention all the time when I say I'm pale, I mean really pale so 'medium bronze' is probably a shade or two darker for me. I find best to apply at night before bed then shower in the morning which leaves me with a golden natural looking glow. I had so many compliments from friends and family saying I look a lot better with a bit of colour to me (I often get the "are you ill?" comments). Now possibly the best product I got sent was the Exfoliating Tan Remover* (£3.99), usually I find it so hard to get rid of any patchy areas after a few days of wearing self tan. I was so excited to see this and was even more excited to try it out. It clears up any patches as well as removing dead skin cells, making your next tan application even smoother! You can also use this product after applying your tan to make sure you have a flawless tan that's even and smooths out colour! I can't recommend Sunkissed products enough and I personally can't wait to purchase some more. I'm pretty sure it will be my go to product for a natural glowing tan for the party season. I'm super pale too but have never used fake tan as I'm so scared of looking orange! These sound like really great products and they're so reasonably priced, too, so not gonna break the bank if I don't get on with them - I'm thinking they might be worth a try!